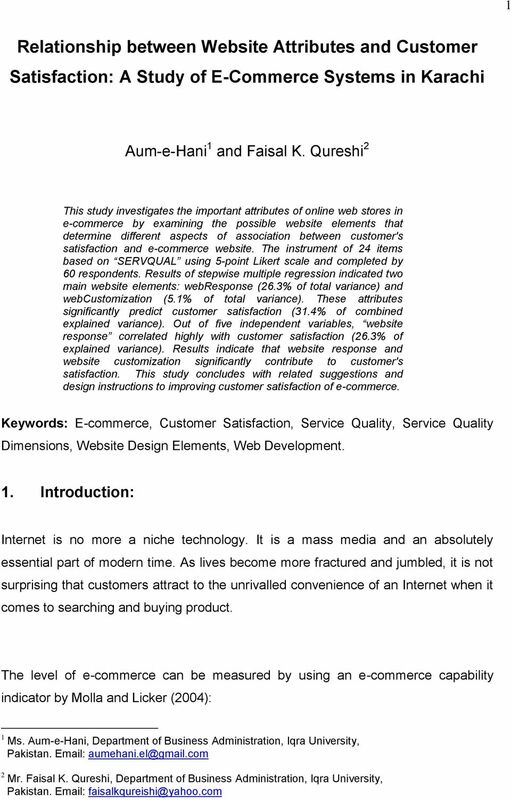 Download "Relationship between Website Attributes and Customer Satisfaction: A Study of E-Commerce Systems in Karachi"
1 1 Relationship between Website Attributes and Customer Satisfaction: A Study of E-Commerce Systems in Karachi Aum-e-Hani 1 and Faisal K. Qureshi 2 This study investigates the important attributes of online web stores in e-commerce by examining the possible website elements that determine different aspects of association between customer's satisfaction and e-commerce website. The instrument of 24 items based on SERVQUAL using 5-point Likert scale and completed by 60 respondents. Results of stepwise multiple regression indicated two main website elements: webresponse (26.3% of total variance) and webcustomization (5.1% of total variance). These attributes significantly predict customer satisfaction (31.4% of combined explained variance). 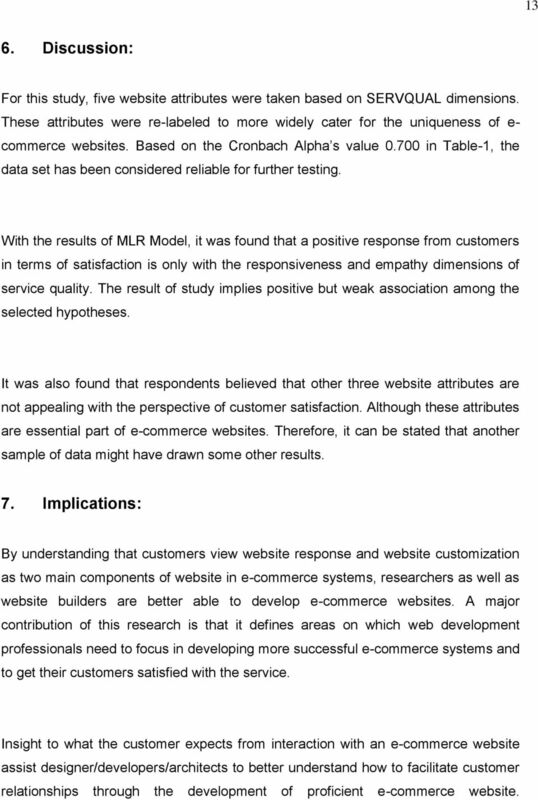 Out of five independent variables, website response correlated highly with customer satisfaction (26.3% of explained variance). Results indicate that website response and website customization significantly contribute to customer's satisfaction. 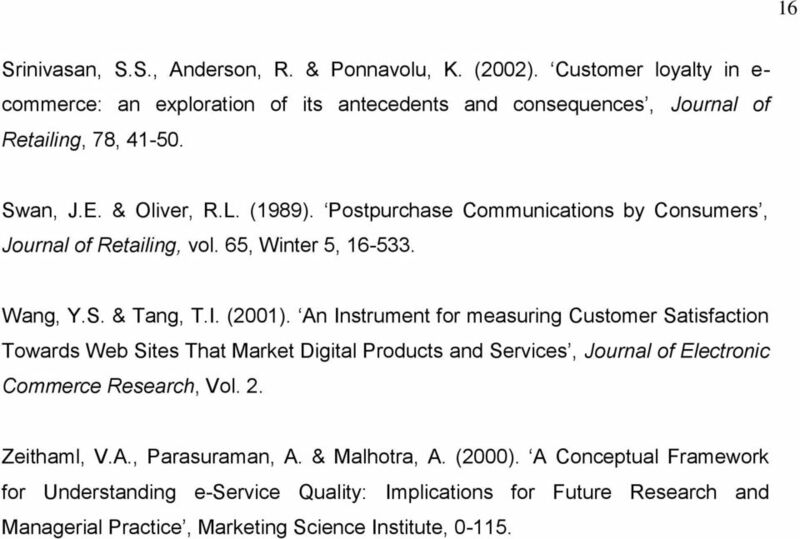 This study concludes with related suggestions and design instructions to improving customer satisfaction of e-commerce. Keywords: E-commerce, Customer Satisfaction, Service Quality, Service Quality Dimensions, Website Design Elements, Web Development. 1. Introduction: Internet is no more a niche technology. It is a mass media and an absolutely essential part of modern time. As lives become more fractured and jumbled, it is not surprising that customers attract to the unrivalled convenience of an Internet when it comes to searching and buying product. The level of e-commerce can be measured by using an e-commerce capability indicator by Molla and Licker (2004): 1 Ms. Aum-e-Hani, Department of Business Administration, Iqra University, Pakistan. 2 Mr. Faisal K. Qureshi, Department of Business Administration, Iqra University, Pakistan. 2 2 No e-commerce indicates company without or Internet connection. Connected e-commerce represents company that has Internet connection and . Informational e-commerce indicates company using website to publish basic information about the company and its products/services in static manner. Interactive e-commerce allows users to search the company s product catalogue, make queries, and enter orders. Transactional e-commerce allows online selling and purchasing of products/services including online payment and customer service. E-business applications can be divided into three categories. First is an internal business system in which CRM and ERP type of systems are involved. Second is enterprise communication and collaboration such as CMS and web conferencing etc. Third is e-commerce that includes Business-to-business e-commerce and Businessto-customer e-commerce. Online shopping comes under this category on which this study is conducted. 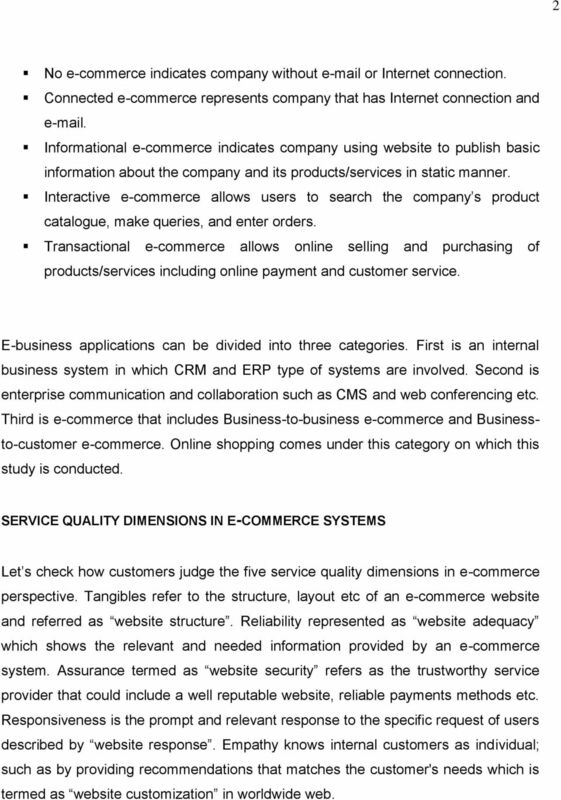 SERVICE QUALITY DIMENSIONS IN E-COMMERCE SYSTEMS Let s check how customers judge the five service quality dimensions in e-commerce perspective. Tangibles refer to the structure, layout etc of an e-commerce website and referred as website structure. Reliability represented as website adequacy which shows the relevant and needed information provided by an e-commerce system. Assurance termed as website security refers as the trustworthy service provider that could include a well reputable website, reliable payments methods etc. Responsiveness is the prompt and relevant response to the specific request of users described by website response. Empathy knows internal customers as individual; such as by providing recommendations that matches the customer's needs which is termed as website customization in worldwide web. 3 3 CUSTOMER SATISFACTION AND SERVICE QUALITY Customer satisfaction refers the level to which clients are pleased with the products or services offered by a company. Gaining good level of customer satisfaction is extremely important to a business as the satisfied customer is most expected to be loyal and to make repetitive purchases. INCREASED TREND OF ONLINE SHOPPING IN PAKISTAN The trend of an online surfing is increasing rapidly due to the increased benefits by the use of e-commerce business environment. People visit e-commerce web sites not only for buying but for several other reasons and the smart retailer just should not only focus on boosting online browse-to-buy conversion rates, but should also try to grab the attention of an online visitors who came in for review so as they could become a customer later. Many people feel it comfortable to review the products through an extensive knowledge provided over the internet before actually buying a particular product. Thus, the e-commerce systems reduce the time and efforts required for the first step of information search in consumer decision making process. 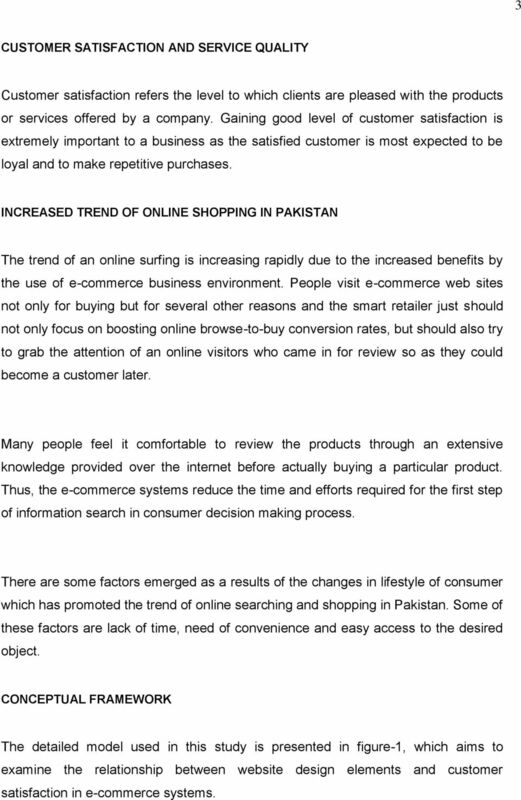 There are some factors emerged as a results of the changes in lifestyle of consumer which has promoted the trend of online searching and shopping in Pakistan. Some of these factors are lack of time, need of convenience and easy access to the desired object. 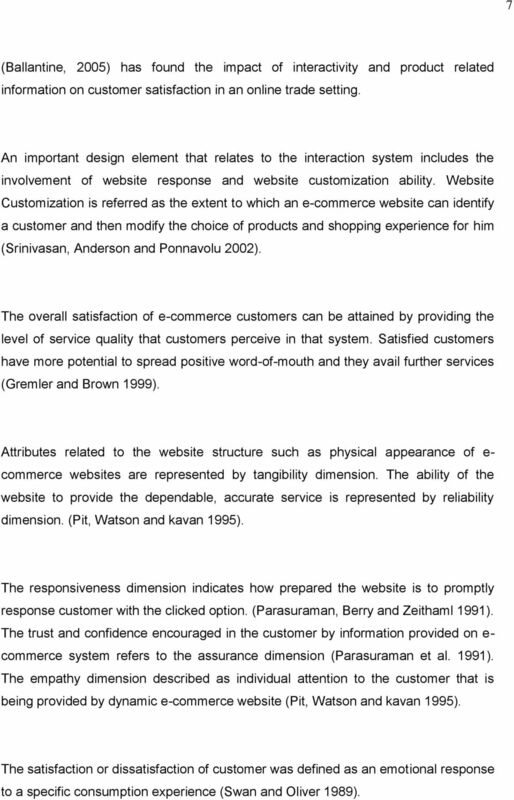 CONCEPTUAL FRAMEWORK The detailed model used in this study is presented in figure-1, which aims to examine the relationship between website design elements and customer satisfaction in e-commerce systems. 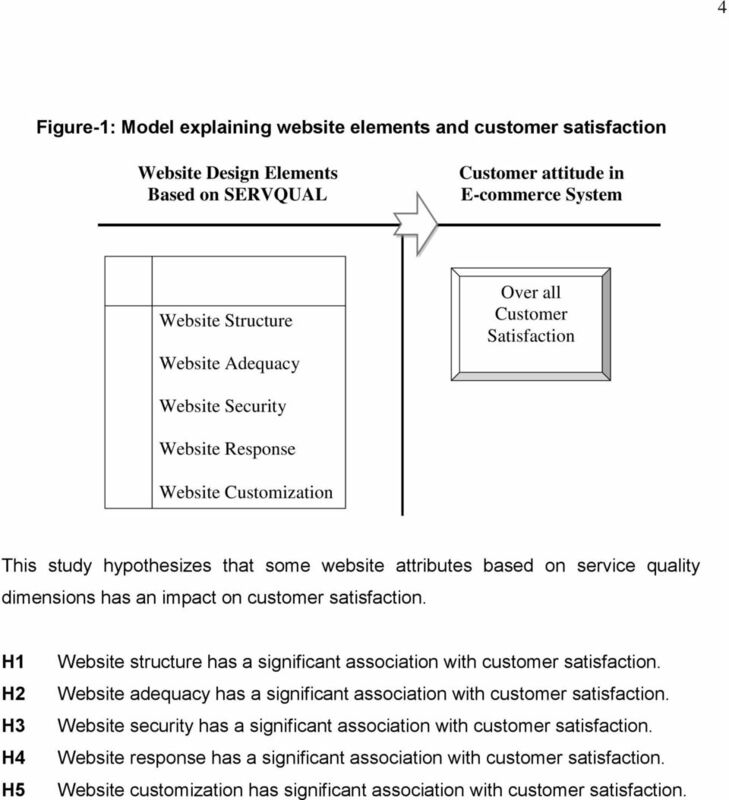 4 4 Figure-1: Model explaining website elements and customer satisfaction Website Design Elements Based on SERVQUAL Dimensiions Customer attitude in E-commerce System Website Structure Website Adequacy Over all Customer Satisfaction Website Security Website Response Website Customization This study hypothesizes that some website attributes based on service quality dimensions has an impact on customer satisfaction. H1 H2 H3 H4 H5 Website structure has a significant association with customer satisfaction. Website adequacy has a significant association with customer satisfaction. Website security has a significant association with customer satisfaction. Website response has a significant association with customer satisfaction. Website customization has significant association with customer satisfaction. 6 6 direct service interactions. 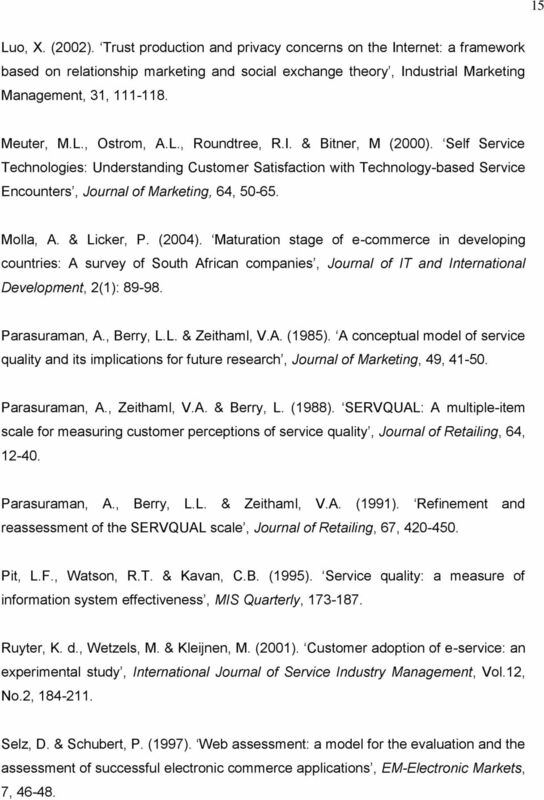 Research extended in other context and as a result reduced the scale to 5 dimensions (reliability, responsiveness, assurance, empathy and tangibles) Initially the concept of services was created to capture the nature of direct service encounters (Meuter, Ostrom, Roundtree and Bitner 2000) which may not be sufficient to capture the characteristics of e-services. Later on, researchers (Kaynama and Black 2000; Zeithaml, Parasuraman and Malhotra 2000) proposed the use of existing service theory as first type. The second type utilizes new categories for self-service technologies such as e-services (Wang and Tang 2001; Ruyter, Wetzels and Kleijnen 2001). 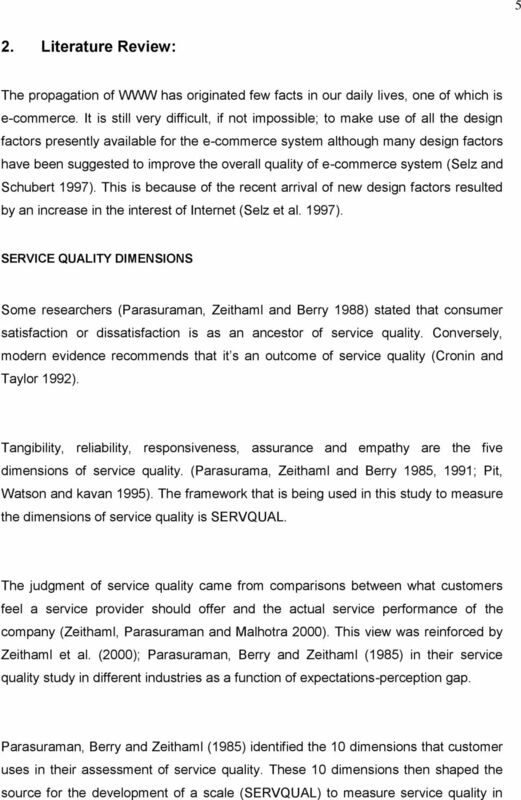 Third type develops information systems and web quality theory (Aladwani and Palvia 2001). The features that are useful, accurate and comprehensive reflect the reliability of quality information (Bailey and Pearson 1983). Bailey et al. (1983) also identified that website reliability depends on to what level the information provided on the website about the product/service is true, precise and to what level a customer can rely on a particular website. (Luedi, 1997) stated that website personalization based on the ability of website to deliver individualized interface for user generated dynamically as per user s needs. 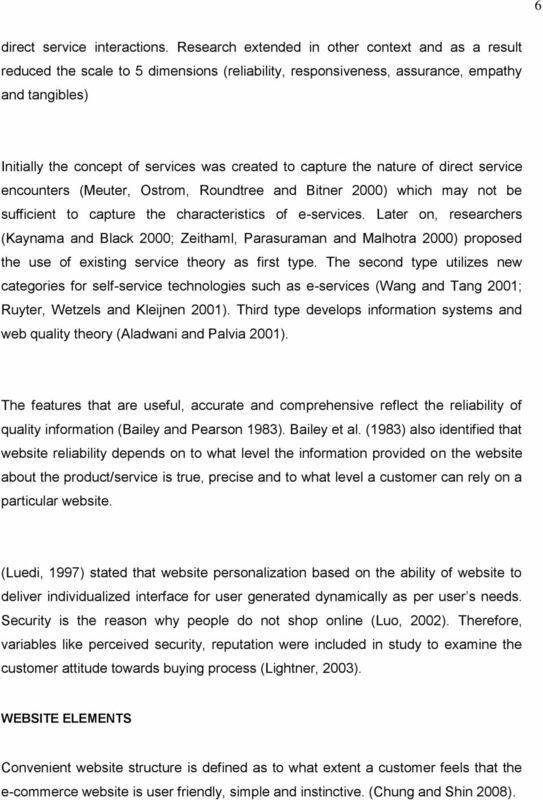 Security is the reason why people do not shop online (Luo, 2002). Therefore, variables like perceived security, reputation were included in study to examine the customer attitude towards buying process (Lightner, 2003). WEBSITE ELEMENTS Convenient website structure is defined as to what extent a customer feels that the e-commerce website is user friendly, simple and instinctive. (Chung and Shin 2008). 7 7 (Ballantine, 2005) has found the impact of interactivity and product related information on customer satisfaction in an online trade setting. An important design element that relates to the interaction system includes the involvement of website response and website customization ability. Website Customization is referred as the extent to which an e-commerce website can identify a customer and then modify the choice of products and shopping experience for him (Srinivasan, Anderson and Ponnavolu 2002). The overall satisfaction of e-commerce customers can be attained by providing the level of service quality that customers perceive in that system. Satisfied customers have more potential to spread positive word-of-mouth and they avail further services (Gremler and Brown 1999). Attributes related to the website structure such as physical appearance of e- commerce websites are represented by tangibility dimension. The ability of the website to provide the dependable, accurate service is represented by reliability dimension. (Pit, Watson and kavan 1995). The responsiveness dimension indicates how prepared the website is to promptly response customer with the clicked option. (Parasuraman, Berry and Zeithaml 1991). The trust and confidence encouraged in the customer by information provided on e- commerce system refers to the assurance dimension (Parasuraman et al. 1991). The empathy dimension described as individual attention to the customer that is being provided by dynamic e-commerce website (Pit, Watson and kavan 1995). The satisfaction or dissatisfaction of customer was defined as an emotional response to a specific consumption experience (Swan and Oliver 1989). 9 9 A survey was conducted by going to the software organizations that are involved in business of web development. The respondents were web developers, web architects and project managers. PROCEDURE First, applying the reliability test on the data, the internal consistency of a set of variables in what it is intended to measure, was checked. In this study, a principle of testing was based on the measurement of Cronbach Alpha. The high value of the Cronbach alpha coefficients in Table-1 indicates that the website attributes measures are reliable enough to proceed to further analysis. 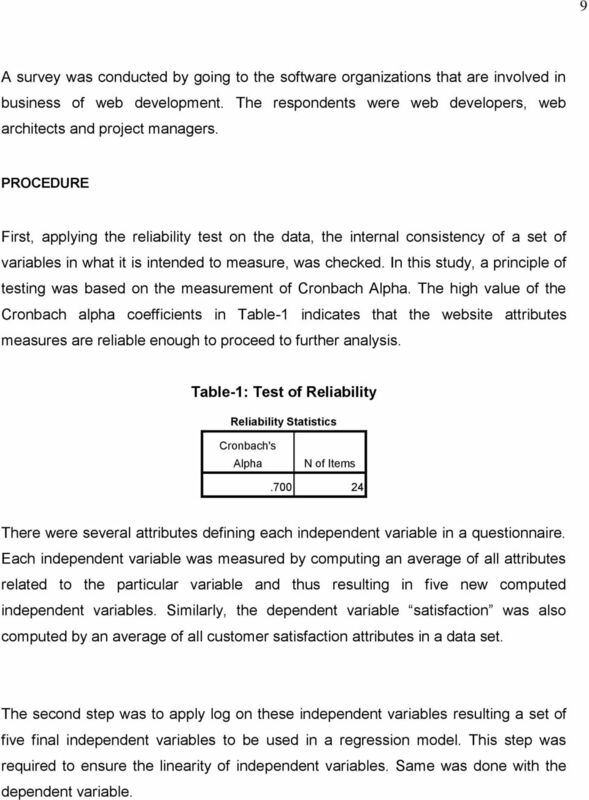 Table-1: Test of Reliability Reliability Statistics Cronbach's Alpha N of Items There were several attributes defining each independent variable in a questionnaire. Each independent variable was measured by computing an average of all attributes related to the particular variable and thus resulting in five new computed independent variables. Similarly, the dependent variable satisfaction was also computed by an average of all customer satisfaction attributes in a data set. The second step was to apply log on these independent variables resulting a set of five final independent variables to be used in a regression model. This step was required to ensure the linearity of independent variables. Same was done with the dependent variable. 10 10 4. Results and Analysis Using stepwise regression between the dependent variable satisfaction and five independent variables termed as webstructure, webadequacy, websecurity, webresponse and webcustomization. 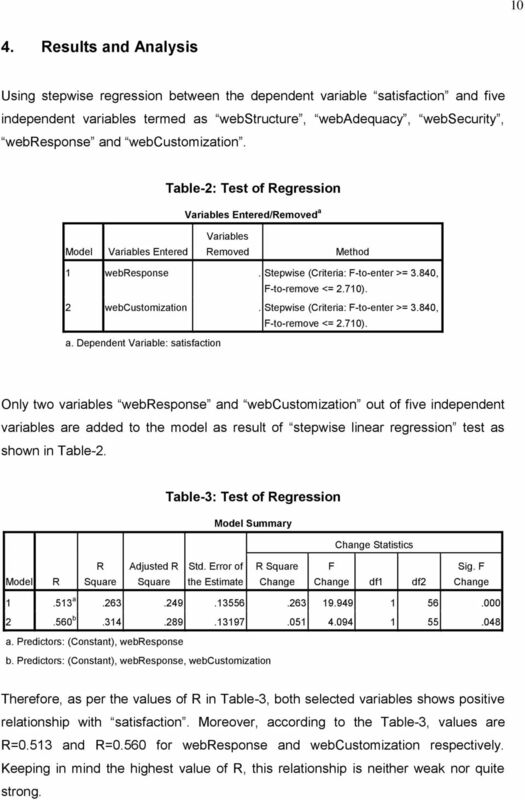 Table-2: Test of Regression Variables Entered/Removed a Variables Model Variables Entered Removed Method 1 webresponse. Stepwise (Criteria: F-to-enter >= 3.840, F-to-remove <= 2.710). 2 webcustomization. Stepwise (Criteria: F-to-enter >= 3.840, F-to-remove <= 2.710). a. Dependent Variable: satisfaction Only two variables webresponse and webcustomization out of five independent variables are added to the model as result of stepwise linear regression test as shown in Table-2. Table-3: Test of Regression Model Summary Change Statistics Model R R Square Adjusted R Square Std. Error of the Estimate R Square Change F Change df1 df2 Sig. F Change a b a. Predictors: (Constant), webresponse b. Predictors: (Constant), webresponse, webcustomization Therefore, as per the values of R in Table-3, both selected variables shows positive relationship with satisfaction. Moreover, according to the Table-3, values are R=0.513 and R=0.560 for webresponse and webcustomization respectively. Keeping in mind the highest value of R, this relationship is neither weak nor quite strong. 11 11 The adjusted R-square presents an idea of how well the model generalizes. Ideally the value of adjusted R-square is to be an equal or very close to the value of R- square. In Table-3, the difference for the final model is a fair bit ( = or 2.5%). This contraction defines that if the model was resultant of the population relatively than a sample it would explain for around 2.5% less variance in the result. Table-4: Test of Regression B Coefficients a Unstandardized Coefficients Standardized Coefficients Correlations Collinearity Statistics Model B Std. Error Beta t Sig. Zeroorder Partial Part Toleranc e VIF 1 (Constant) webresponse (Constant) webresponse webcustomization a. 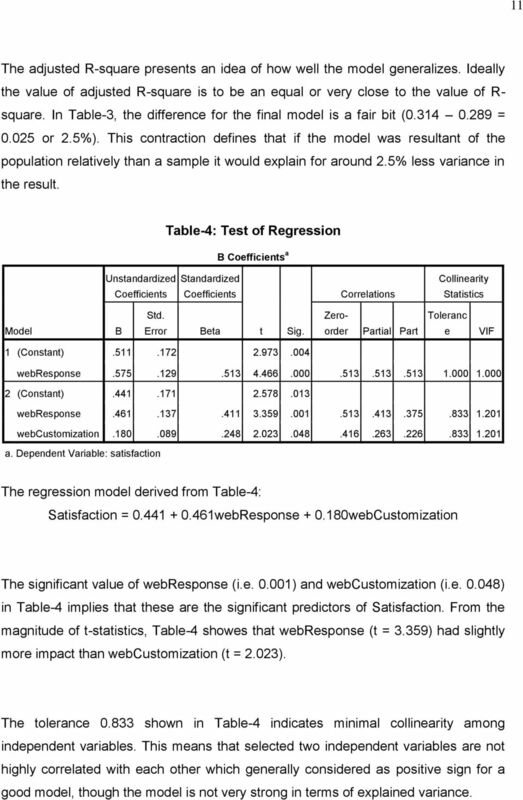 Dependent Variable: satisfaction The regression model derived from Table-4: Satisfaction = webResponse webCustomization The significant value of webresponse (i.e ) and webcustomization (i.e ) in Table-4 implies that these are the significant predictors of Satisfaction. From the magnitude of t-statistics, Table-4 showes that webresponse (t = 3.359) had slightly more impact than webcustomization (t = 2.023). The tolerance shown in Table-4 indicates minimal collinearity among independent variables. This means that selected two independent variables are not highly correlated with each other which generally considered as positive sign for a good model, though the model is not very strong in terms of explained variance. 12 12 5. Findings PREDICTING SATISFACTION Tables-3 and 4 provide results of the MLR analysis conducted to examine the impact of service quality dimensions on satisfaction. Based on the results in Table-3, it seems that both models have worked well in explaining the variation in satisfaction (Model-1: F=19.949; p=.000; Model-2: F=4.094; p=.048). Overall, Hypothesis-4 was better fitted compared to hypothesis-5 as indicated by F-value. The combined variance (Table-3) explained by both variables is 31.4% out of which 26.3% variance is explained individually by webresponse and only 5.1% variance in satisfaction explained by webcustomization. Rest of the 68.6% unknown variance is due to other factors. This is a very less percentage of explained variance so the model is not a very good model. Table-5: Test of Regression Excluded Variables c Model Beta In T Sig. Partial Correlation Collinearity Statistics Tolerance VIF Minimum Tolerance 1 webstructure.056 a webadequacy.081 a websecurity.176 a webcustomization.248 a webstructure.024 b webadequacy.074 b websecurity.141 b a. Predictors in the Model: (Constant), webresponse b. Predictors in the Model: (Constant), webresponse, webcustomization c. Dependent Variable: satisfaction If sig. value is less than 0.05 we reject Ho and accept the hypothesis otherwise we accept Ho. On the basis of Sig. values belong to each of the three variables shown in step-2 of Table-5; three hypotheses (H1, H2 and H3) have been rejected while two hypotheses (H4 and H5) stand accepted. 13 13 6. 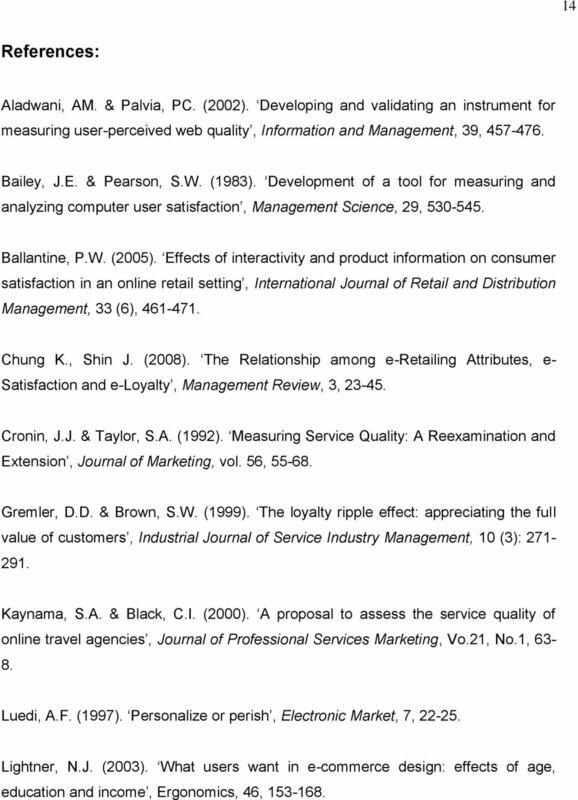 Discussion: For this study, five website attributes were taken based on SERVQUAL dimensions. These attributes were re-labeled to more widely cater for the uniqueness of e- commerce websites. Based on the Cronbach Alpha s value in Table-1, the data set has been considered reliable for further testing. With the results of MLR Model, it was found that a positive response from customers in terms of satisfaction is only with the responsiveness and empathy dimensions of service quality. The result of study implies positive but weak association among the selected hypotheses. It was also found that respondents believed that other three website attributes are not appealing with the perspective of customer satisfaction. Although these attributes are essential part of e-commerce websites. Therefore, it can be stated that another sample of data might have drawn some other results. 7. Implications: By understanding that customers view website response and website customization as two main components of website in e-commerce systems, researchers as well as website builders are better able to develop e-commerce websites. A major contribution of this research is that it defines areas on which web development professionals need to focus in developing more successful e-commerce systems and to get their customers satisfied with the service. Insight to what the customer expects from interaction with an e-commerce website assist designer/developers/architects to better understand how to facilitate customer relationships through the development of proficient e-commerce website. Assessment of service quality dimensions in healthcare industry A study on patient s satisfaction with Bangladeshi private Hospitals.